. *Significant improvement in wearers’ Balance.
.*The BEAM™ Pendant and BEAM™ Band hold the “imprint” for Balance Energy And Motion.
.*BEAM™ Pendant is slightly smaller than the dimension of a dime.
.*Can be worn on a necklace.
.*Can be used as a charm on a bracelet.
.*Convenient as a watch band. We love the new design of the B.E.A.M. Pendant! 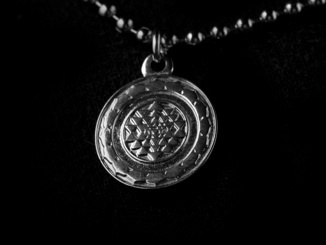 Not only does the pendant carry the powerful B.E.A.M. 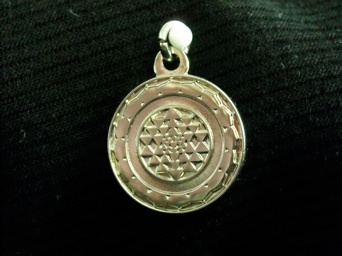 Imprint, but the design itself is called the Sri Yantra and represents the “instrument of wealth and success”. 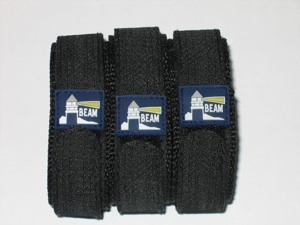 The B.E.A.M.™ Band can be worn as a stylish, stand alone wristband or the B.E.A.M.™ Band may be used as a watch band as well. This gives the wearer a double function, a watch band containing the B.E.A.M.™ Technology! 1. A watch face with 20mm spring pins. 1. Remove existing watchband, leaving spring pins on the watch face. 2. Slip the narrow strap of the B.E.A.M. Band through both spring pins. 3. 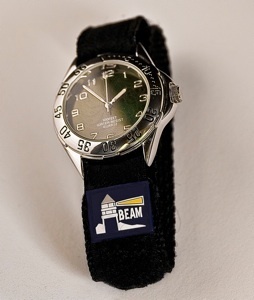 Slide your watch down the strap to the “BEAM” tag. 4. Wrap around wrist until snug.